3 When the Lamb opened the second seal, I heard the second living creature say, “Come!” 4 Then another horse came out, a fiery red one. 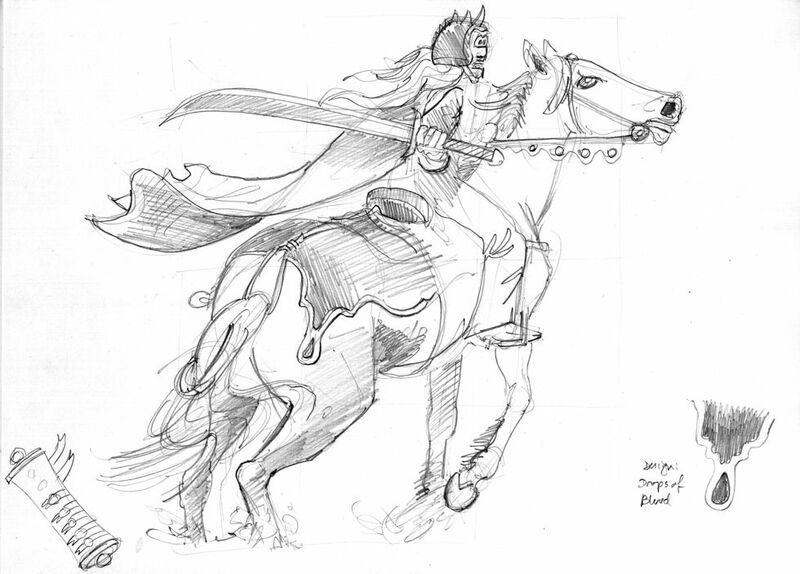 Its rider was given power to take peace from the earth and to make men slay each other. To him was given a large sword. The rider on the red horse. 01) (This page) Revelation 06 – The Scroll seals – Scene 02 – Second seal: Red rider (with scroll). 02) (Next page) Revelation 06 – The Scroll seals – Scene 02 – Second seal: Red rider (without scroll). 03) (Following page) Revelation 06 – The Scroll seals – Scene 02 – Second seal: Red rider (with blood). 01) Revelation 06 – The Scroll seals – Scene 02 – Second seal: Red rider (with scroll). This version has the 7 seal scroll in the bottom left corner of the scene, with the second seal opened. This scene includes a rider of a red horse, which equestrians would describe as Palomino, since the horse has a red body and pale mane and tail. I used a photograph from the internet for the basis of the horse and rider. In the photograph the horse and rider are competing at Pole bending, which is a timed event that features a horse and one mounted rider, running a weaving or serpentine path around six poles arranged in a line. If you look carefully you can see that the rider is guiding the horse in a tight right hand turn, with dust and debris flying up from the horse’s hooves. 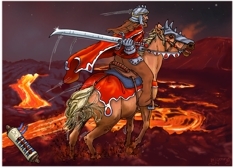 The red horse’s rider is empowered to take peace from the earth and to slay many. He has a large sword, which indicates the warfare on the earth that will follow his release. In keeping with the red theme (and especially in response to the description of “a fiery red one” in verse 6:3 above!) I decided to add molten lava fields and a volcano in the background. I also decided to add blood red colour to the horse blanket, including drops of blood in the design. I’ve given the rider red-tinged hair. 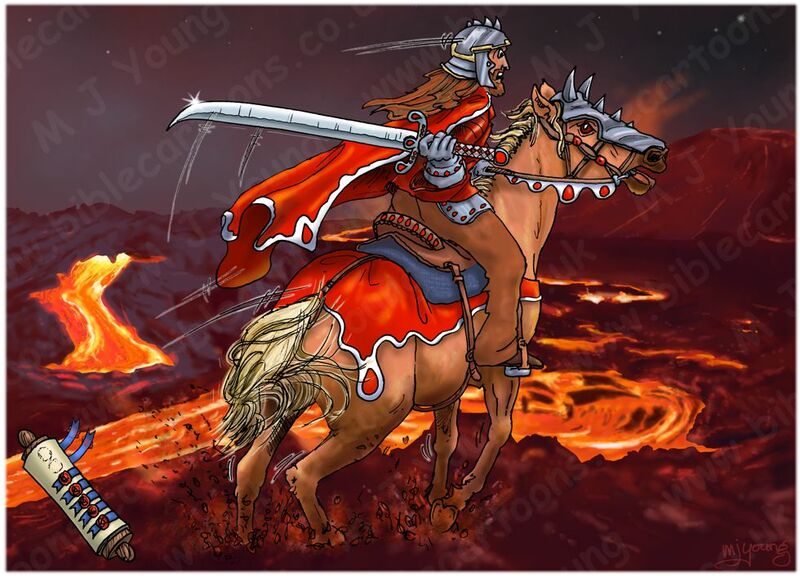 There is also blood red in the horse’s tack, in the riders sword and clothing, all indicating the violent nature of the riders purpose: warfare on earth.